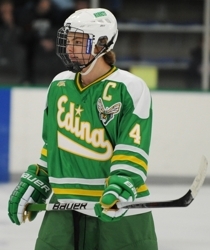 Edina senior defenseman Max Everson has made his college commitment and is expected to play at Harvard University next season, according to Edina coach Curt Giles. Everson reportedly had offers from or had been talking to the University of Minnesota, Yale, Princeton and Ohio State. Max will join his older brother Marshall, Harvard sophomore forward, currently playing for the Crimson. Stay tuned for more details here at the MN Hockey Hub.